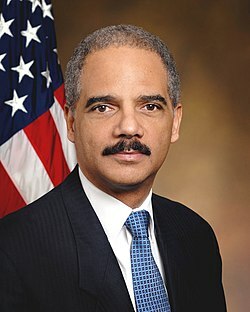 Eric Holder (born January 21, 1951) is an American attorney. He served as the Attorney General of the United States, under President Barack Obama from 2009 to 2015. He is the first African-American to hold that post. Before being named as Attorney General, he was the U.S. Attorney for the District of Columbia under President Clinton and help pick Joe Biden as Obama's running mate. Holder was born in the Bronx. On September 25, 2014, the Justice Department said Holder would resign as soon as his successor is confirmed. He was succeeded by Loretta Lynch on April 27, 2015. ↑ "USDOJ: Office of the Attorney General". US Department of Justice. February 12, 2009. Retrieved February 12, 2009. ↑ Johnson, Carrie (February 3, 2009) [Tuesday]. "Holder Confirmed as the First Black Attorney General: Nominee Overcame Objections in GOP". The Washington Post. p. A02. Retrieved 2009-07-03. ↑ Longstreth, Andrew (June 2008). "Making History With Obama" (Cover Story). Making History. The American Lawyer. Retrieved November 18, 2008. ↑ "The New Team: President Obama has now filled nearly all of the major posts in his new administration". The New York Times. Retrieved 2010-01-03. ↑ Wilber, Del Quentin; Schoenberg, Tom (September 25, 2014). "Holder Said to Plan to Resignation as Attorney General". Bloomberg News. Retrieved September 25, 2014.